Oklahoma has won five games in a row and will go on the road this week as the conference season reaches its half-way point. The first stop on this two game road trip is Lawrence, Kansas. If there was a team that has been more Jekyll & Hyde than the Sooners it is the Kansas Jayhawks. Phog Allen Field House is as tough of place to play as there is but this season it is not impossible to win there. Nevada and Kansas State have won there this season so it’s not too far fetched to think that OU has a legitimate chance. To come away with a win on Sunday afternoon the Sooners will have to put together their best game of the season to this point. Yes, even better than their game against Texas Saturday night. OU plays tough physical defense but must continue to stroke the ball on offense. When the Sooners guards are on they create lots of match-up problems for the opposing team because they can’t focus exclusively on the inside game of the Sooners. 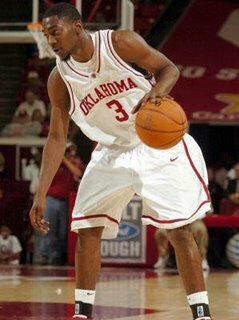 If you play man-on-man defense with the Sooners you will get beat. If you try to double the big men (Gray and Bookout) down low then the guards will find the open jumper. If you move the defense to play the guards out top then that leave Taj Gray and Kevin Bookout with man-on-man down low and they will win that battle. If you play a zone defense, which is your best bet, then the guards can find the holes in the zone and hit open shots. Thus the defensive nightmare created by the Sooners. I think the Sooners will be able to dominate inside against Kansas. OU has been dominating the offensive glass all season and I think that trend will continue again on Sunday. Second chance points will be a necessity for an Oklahoma win. The key for the Sooners will be to just stay in the game. If the Sooners are within 10 points with ten minutes left then they will be in good position. Kansas is 0-5 this season in games decided by 10 points or less. If there ever was a “good year” to play in Lawrence then this is the year. OU is the hottest team in the Big 12 right now with the hottest player in the conference in Terrell Everett.